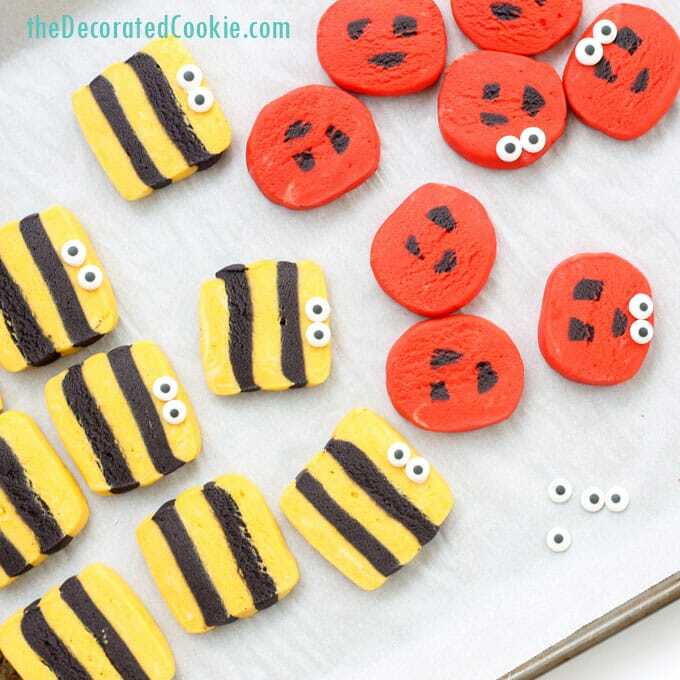 Simple ladybug and bumble bee slice and bake cookies for the bug-lover in your life. 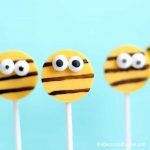 A fun treat for spring or a bug party. 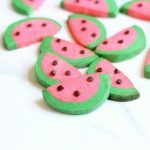 I’ve been wanting to try my hand at slice and bake cookies for awhile now. 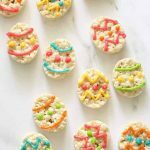 I don’t foresee me developing any grand talent for this cookie decorating style (um, like every slice and bake creation by Eugenie’s Kitchen.) 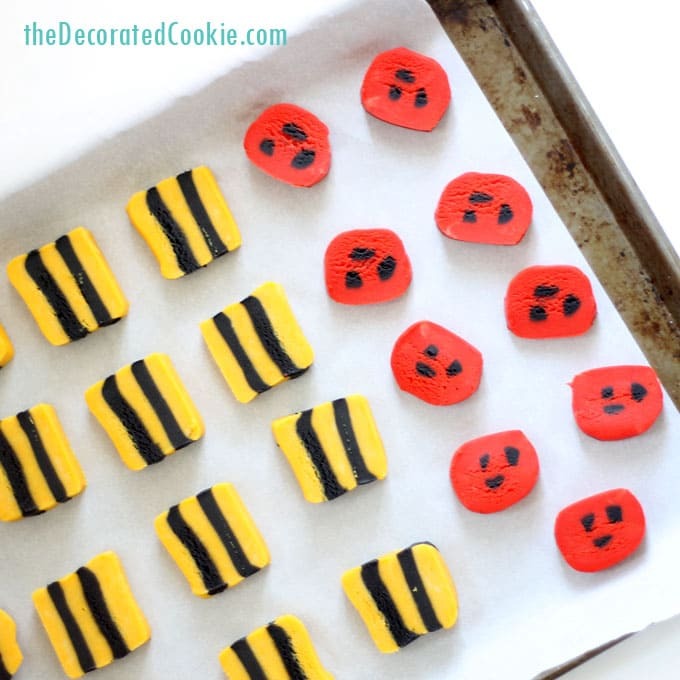 So I stuck with simple designs: Stripes for bumble bees and polka dots for ladybugs. Easy peasy. The lady bugs’ polka dots got a little deformed, but I suppose they are still sort of recognizable as ladybugs. And if not, well, the critic doesn’t get a cookie. Need more buggy ideas? 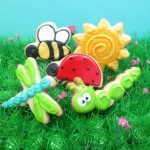 Check out these firefly cookies or this bug chocolate bark. Yeah, they do look pretty wonky for lady bugs, huh? Kind of like smiley faces, too, before I added the candy eyes. 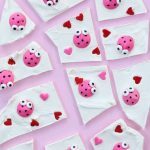 But adding the candy eyes ladybugs them up a bit. 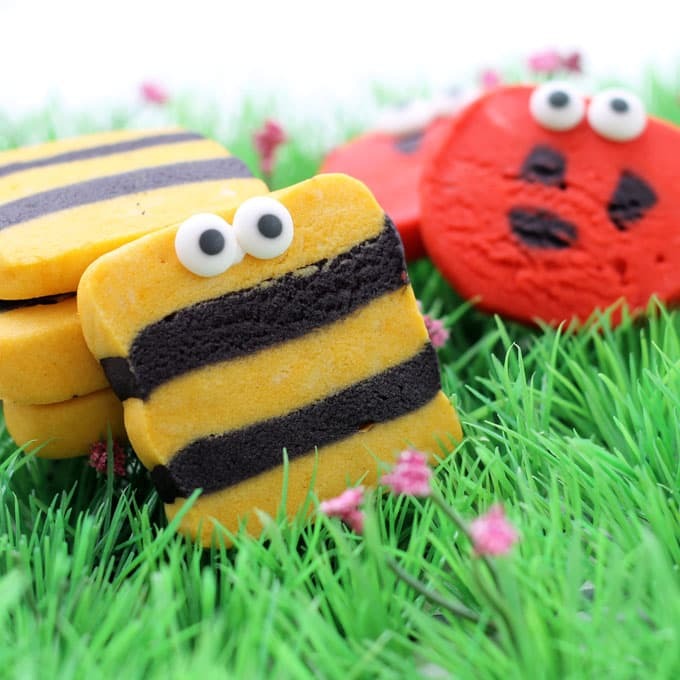 The square bumble bees look good though. Maybe I’ll just stick with squares and stripes. Next up, rainbows? 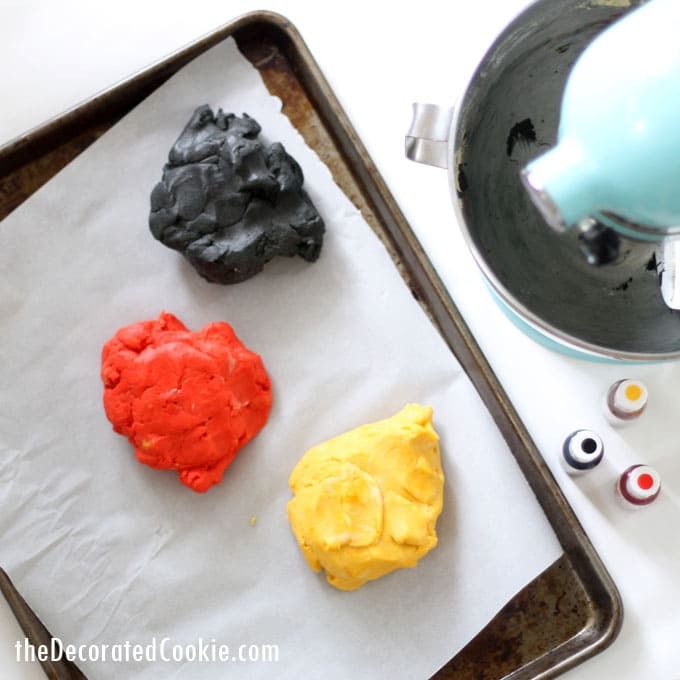 *For food coloring, I suggest Americolor Soft Gel Paste, Red Red, Egg Yellow and Super Black used here. 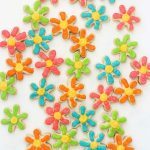 Find candy eyes at the craft store, or click the link to see online. Prepare cookie dough according to the recipe. Divide into thirds and use the food coloring to tint each third yellow, red and black (I had a bit of black left, so you could go lighter on the third for black). 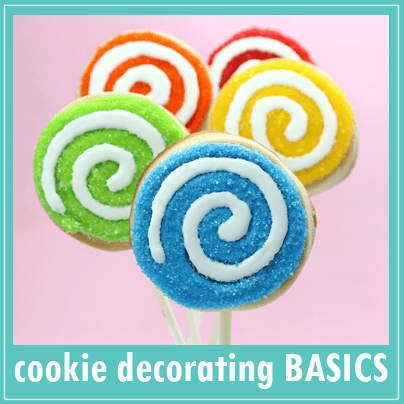 TIP: It’s best to mix the food coloring in the mixer. To avoid washing the bowl each time, remove the dough and divide into thirds. Return one third of the dough back to the bowl and mix yellow. Set aside. Add the next third and tint red. Set aside. Add the last third and tint black. Put each color in ziploc bags and chill in the fridge for at least two hours. 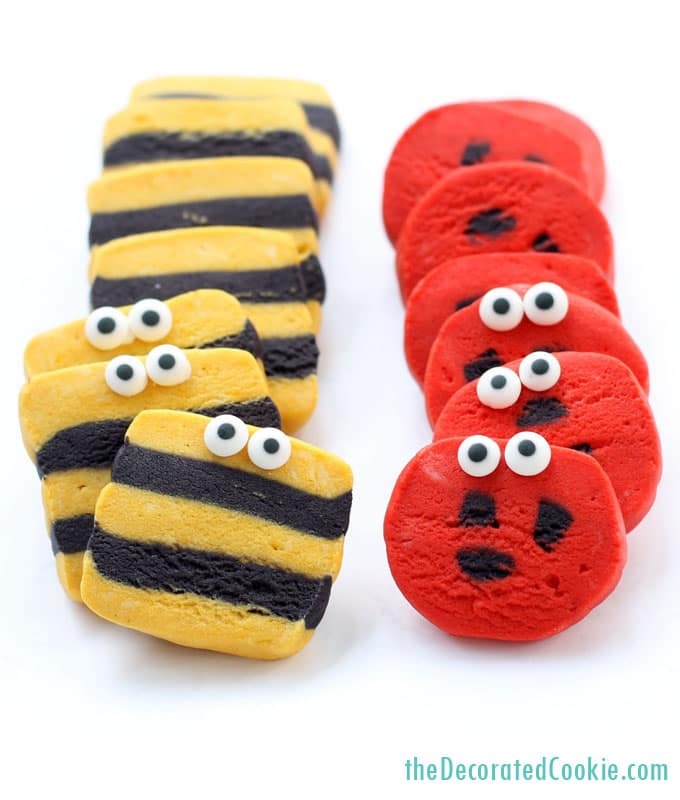 For the bumble bees, press or roll out five strips of dough 3/8-inch thick, six inches long and two inches wide. You’ll need three yellow and two black. 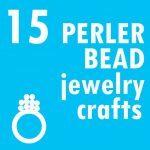 Stack them up (yellow on the bottom and top, alternating colors). And press into a rectangle. I use a dough scraper to help me with this. Wrap in plastic wrap and chill until firm again. 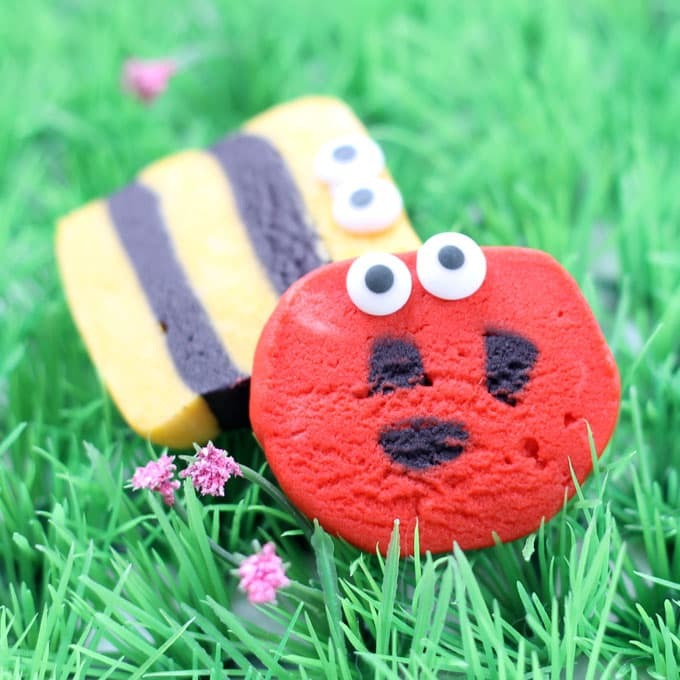 For the lady bugs, press three strips of red dough the same size as for the bees. Roll out a three black skinny logs and three red ones. 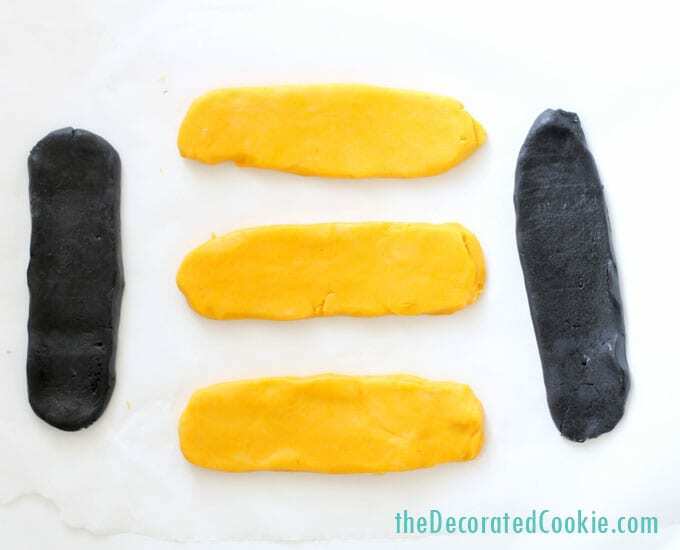 Stack the dough in this order: Red strip on the bottom. The next layer has two black logs in the center sandwiched in between the three red logs. 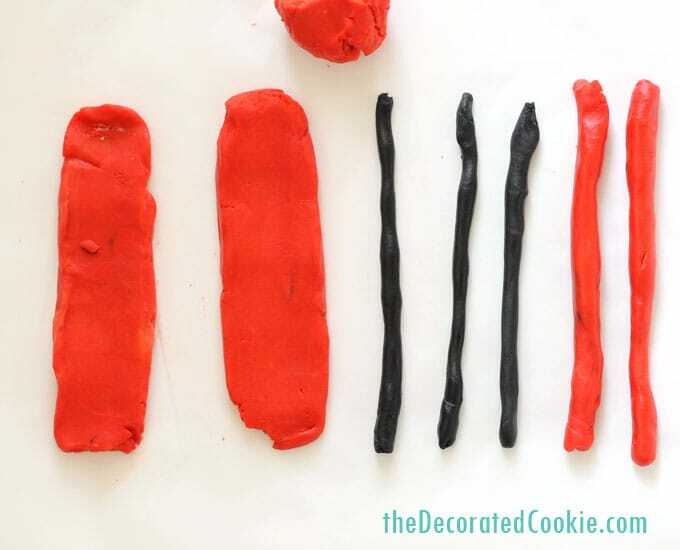 Place a strip of red dough on top. Place a black log on top of that one and finish the top with the last red strip. Gently roll the whole thing into a log. Wrap in plastic wrap and chill until firm again. 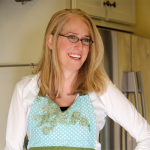 With a sharp knife, cut slices of each log. The ends of each log may not be usable (but they are still eatable). Place on a baking tray lined with parchment and bake in a 375 degree F oven for about 15 minutes or until edges begin to brown. 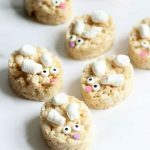 If desired, when cool, attach candy eyes with dabs of light corn syrup or frosting. 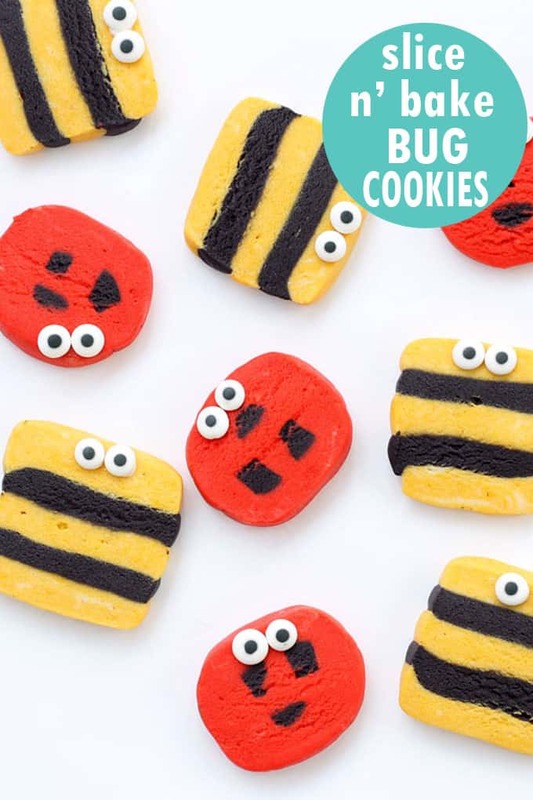 Makes about 16 of each bug cookie. Oh. My. Cuteness! These are so perfect! I’ve always had a soft spot for ladybugs. 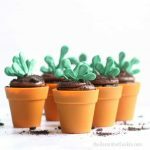 🙂 I definitely need to get in the kitchen and recreate these. And I absolutely love the addition of the candy eyes! super cute!! love them both!! 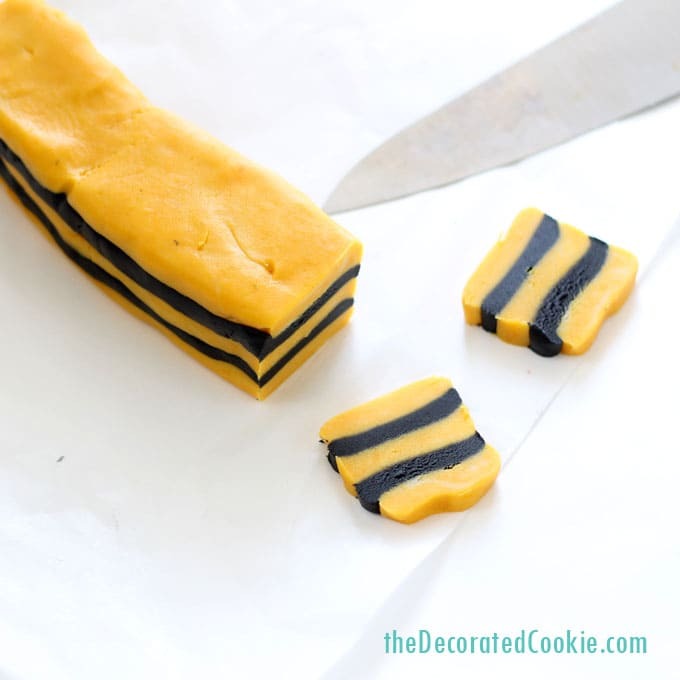 I have yet to try slice and bake cookies with a design inside so great job in my opinion! !